I’ve been throwing darts at various targets for over five years. I am not an excellent thrower by any means. To be quite honest I wasn’t positive that I had reached the level of expertise necessary to successfully hunt with the atlatl. The scheduled date for the hunt was the last weekend in March. In Wisconsin the months prior to this are not quite favorable to warming up the throwing arm outside. Fortunately the sportsman club I belong to allowed me to practice indoors. The darts I used for the hunt were made of bamboo. These needed to be straightened for optimal flight. The ends where I insert the points were reinforced so they wouldn’t split upon impact, lessening the penetration of the point. The points I decided to use were made of steel. One style was a home made point measuring 1 1/2 inches wide and 2 1/2 inches long. The other inserted point was a Zwichy four blade point that was purchased. Both proved very effective. The atlatl I choose to use was made by Victor Ahearn of Michigan. He makes different styles and sizes of atlatls. The one I used is a very flexible thrower made of purple heart wood. 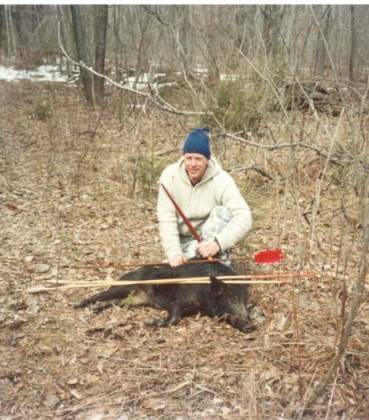 In Wisconsin, the atlatl is not yet recognized as an effective hunting tool. So I was limited to hunting on a game farm in Door County, established by Jeff Kiehnau. He stocks Russian Boar Hogs and other exotic game animals. The morning was blustery and cold. The temperature had dropped into the low teens and stayed there all day. As I stepped into the woods I thought back on my archery hunting experience and how I am going to find an area clear enough of branches to cast my dart at the target. If I find such a spot, the animal wasn’t just going to walk up and present itself for an easy shot, like the targets I had practiced on. Locating the Russian boar hog was easy, finding an open area to throw from proved to be more difficult. Finally the moment arrived . I had pursued the animal for a hour through the hard woods, onto an open field and back into the pine trees. I was standing along side the edge of the pines when into a small clearing the animal appeared. I made my throw , the dart on its way found a branch and glanced upward and behind my target about 20 yards. My heart sank, I had missed. The animal seemed to smile at me and wander off into the pines. The Russian boar hog again presented itself a few minutes later. I had one dart in hand and the other sticking in the ground 40 yards away. My stepbrother Chris, who was filming the hunt, volunteered to retrieve the dart I had thrown earlier. I wonder if this is why earlier man group hunted? The dart was cast and made a good solid hit. The pig turned and started to stagger and run. The dart sticking into him crashing alongside trees worked itself loose. The point was still embedded deep inside the animal. Having the second dart returned, I made a second throw this dart also found it’s mark and entered deep into the target. The Russian boar hog staggered and dropped. The dart had entered and traveled 20 plus inches through the cavity, lungs and into the rib cage , a good kill shot. I had done what my ancestor before me had done to survive. Hunting with the atlatl was a rewarding experience and accomplishment.